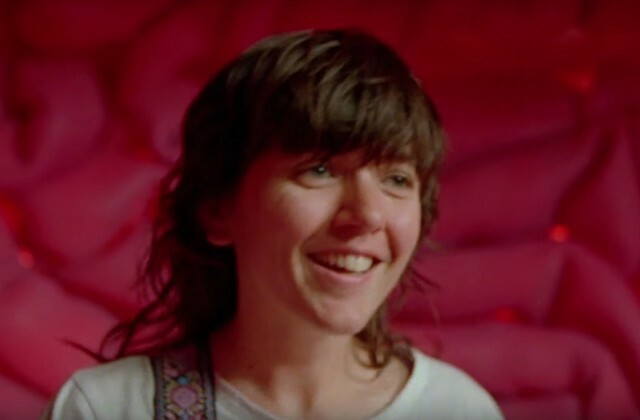 Last week, the nervously articulate Australian guitar-wrecker Courtney Barnett dropped a new single. “Everybody Here Hates You” follows last year’s Tell Me How You Really Feel album, as well as the one-off single “Small Talk.” Barnett says she wrote it while listening to a lot of Jeff Buckley, and it’s a spirited rock rave-up about depression and self-hate and how hard it is for someone else to empathize enough to talk you out of it: “I go to Loving Hut, I get my hair cut, I feel the same / I feel putrid, I’m getting used to it these days.” Good song! And today, Barnett has come out with a video for it. The video’s good, too. Barnett’s regular collaborator Danny Cohen directed the video, and the clip takes the song’s “it’s only in your head” refrain way past its logical conclusion, into the realm of the surreally literal. The “Everybody Here Hates You” video starts out as a continuous-shot performance video, with Barnett and her band playing onstage at a big, ornate, empty venue. But then the camera pans through Barnett’s ear, directly into her brain, and we see her and her band playing there. Inside her brain. While she’s also playing the song in real life. It’s a fun, absurd video about a difficult and dangerous mental state, which means it reflects the tone of the song itself. And there’s also a fun moment where we see inside Barnett’s bandmates’ heads. The whole thing is just an impeccable execution of a great music-video concept, and you can watch it below. “Everybody Here Hates You” is out now on the streaming services.